We are guardians of two amazing rescue dogs, Stimpy and Lily. Stimpy is an 11-ish year old blind chihuahua mix with an adorable overbite and a grumpy old man attitude. Lily is a 3.5 year old mama dog who is a big lover and considers Stimpy her grumpy puppy. These dogs are our "children" and we consider ourselves very diligent and organized pet guardians, so we did a lot of research into what our dogs would need to travel the US. Even with all the planning there were some things we overlooked and want you to learn from our experiences. We are dog people but a lot of this info is probably still relevant to other pets. Stimpy is an older guy with really bad teeth. He had had two prior dentals in 2012 & 2013. I knew he needed another but kept putting it off because I was concerned about putting him under anesthesia again. I made a last minute decision to move forward with one more dental before we hit the road. Due to our vets schedule, we had to wait a few weeks for an appointment. The appointment was the last thing keeping us from hitting the road. Stimpy ended up having 7 teeth extracted. We headed south the next day, with Stimpy doped up on pain medication. He didn't have any complications from his prior dentals so I wasn't expecting any this time. A few days after the procedure, a lymph node in his neck swelled and he stopped eating. 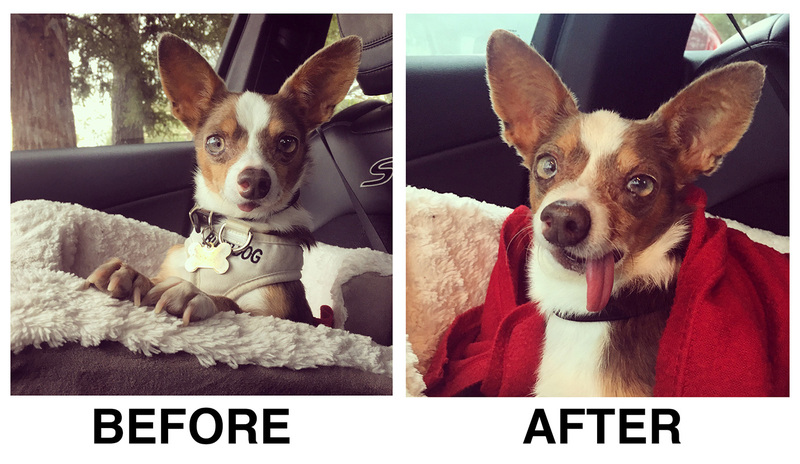 We had to find a vet near LA on a Saturday to get him on some new medication. In hindsight I wish had decided to have the dental done earlier so we could have been at our regular vet during his recovery time. My advice to you is don't leave "the big stuff" until the end. We make many hard decisions in the best interest of our pets and I know how conflicting it can be. Consult your vet but also listen to your gut. This may seem like a no-brainer but make sure your dogs are up to date on their vaccinations. Ours were, but it wasn't until our final vet visit two weeks before we hit the road that we learned about some optional vaccinations that might be beneficial to traveling dogs. Leptospirosis is a bacterial infection that you can vaccinate against but suburban dogs aren't generally given this vaccine. "The infection rate for domestic pets has been increasing in the U.S. And Canada, with infections occurring most commonly in the fall season. Dogs will typically come into contact with the leptospira bacteria in infected water, soil, or mud, while swimming, passing through, or drinking contaminated water, or from coming into contact with urine from an infected animal. This last method of contact might take place in the wild. Hunting and sporting dogs, dogs that live near wooded areas, and dogs that live on or near farms are at an increased risk of acquiring this bacteria." Leptospirosis vaccine needs to be administered in two doses, two to four weeks apart. Lily has already been given the vaccine but Stimpy hasn't. There are side effects to the vaccine (google Lepto vaccine side effects) and since Stimpy is older (and probably part doxie which have reports of higher than average side effects) I plan on doing a lot more research before I decide if he should get it. I'll update this post with my decision when I make it. 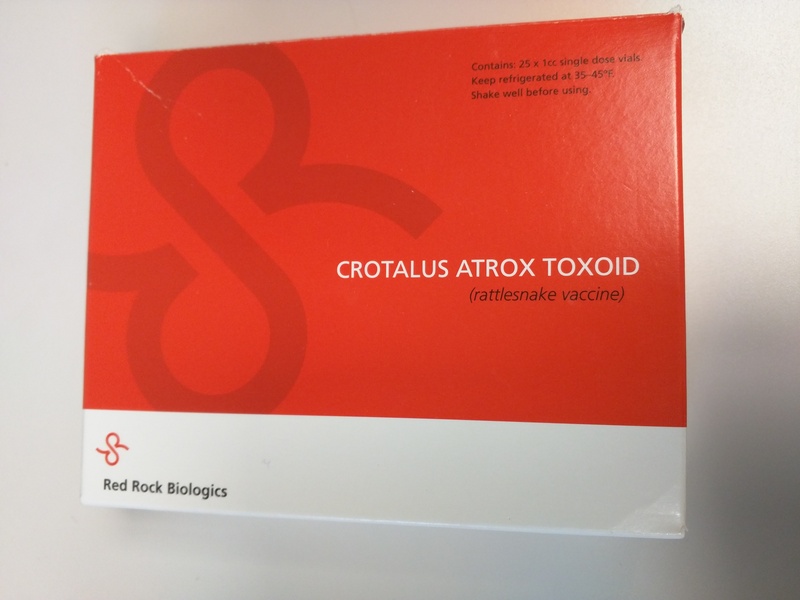 Rattlesnake "vaccine" (toxin acclimatization, says Tommi) can lessen the severity of a snake bite. Our vet suggested we do our own research as its validity isn't 100% proven. It's not actually a vaccine, but a low dose of the snake venom, intended to get your dogs body used to the venom. Our initial reading says that if your dog is bitten you still need to seek emergency care immediately but this supposedly buys you more time. It also doesn't work if the snake that bites your dog has different kind of venom than in the shot. The manufacturer says it can provide protection for six months and up to one year. Not all vets carry it. It's given as two shots 4 weeks apart. Due to timing we were unable to get it for our dogs before leaving, but since we will be spending a lot of time in the desert we likely will once we get to our new home base vet in Texas. In general, talk to your regular veterinarian as early as possible about your travel plans and the areas you'll be visiting. Our vet was able to get our dogs vaccinations/check-ups synched so that the next time we will need to see a vet is in 6 months which eliminates the need for multiple office visits throughout the year, which will save us money. We plan on establishing a new "home base" vet in Texas for the bi-yearly check-ups and vaccinations. If your dog isn't already on some type of preventative medicine for these issues, do research or ask your vet about the areas you'll be traveling in. Heartworm disease is transmitted by infected mosquitos and has been diagnosed in all 50 states. A simple blood test is needed to confirm your dog is heartworm free, then you can start the monthly preventative medicine. The blood test is repeated 6 months later to make sure there were no new heartworms before the preventative started working, and yearly tests are recommended going forward. We use HeartGuard which is a tasty treat so your dogs should love getting it. It's very important you stay on track with administering it monthly, otherwise you will need to get another blood test before you can give it again. We like 1-800-PetMeds (Tommi says use a Vet-VIPPS accredited pharmacy). Sometimes we use the online pharmacy affiliated with our last sticks-and-bricks vet, because of prices or out-of-stock situations. Our vet was able to give us 6 month prescriptions for most medications and with enough planning we can have our order shipped to our next destination. Stimpy also needs daily eye drops. One of the drops only has a 30 day shelf life so unfortunately I can't stock up on it. I use CVS to fill his eye drop prescriptions while on the road. Our FMCA membership gets me a slight discount too! ..and to prevent one. We have some gear and first aid supplies in case our dogs get lost or hurt. Both dogs are microchipped and wear collars and ID tags with both of our phone numbers. For medium to large dogs, Lily's ID tag is great because it can't get stuck on obstacles, and unlike other similar designs this one can slip onto a plastic buckle collar. Another option are these embroidered collars, though fitting two phone numbers there is harder. Have the microchip account also list contact info for someone who isn't traveling with you. When out in the dark, the dogs wear blinking lights. Lily's light clips on to her harness or collar; the harness works better at keeping it pointed upward. Stimpy is smaller so he needed a clip-on light, but beware, it has unclipped itself a few times already. These lights are built for hunting dogs and are significantly brighter and sturdier than typical pet store gadgets. Reviews say green and yellow are the most visible colors, and we're very happy with them. A muzzle for Lily. Stimpy is almost toothless at this point but Lily has all her chompers and is still getting used to being handled. She can get growly so if something painful were to happen to her on the road that needs our attention we might consider putting a muzzle on to keep her teeth away from our helping hands. Spare leash and collars in case the existing ones break or get lost. Styptic powder stops bleeding if we accidentally cut their nails to the quick, and military-style clotting sponges will stop more severe bleeding. For the most part, human first aid supplies work for dogs too. Did you know that FMCA offers you help with your pets in the event you have a medical emergency or accident and are unable to get them home? We didn't know until we got our membership so we wanted to point it out to you. Scan everything. You can keep hard copies too but having your pets records on a USB stick will come in handy when you have to go to a new vet on the road. You may also consider uploading it to the cloud as well in case something were to happen to the USB stick. Some people like The Petsmart veterinary chain, Banfield. The benefit of going with a large chain like this is that your pets records will be accessible at any Banfield. They offer plans that cover a wide variety of services for a set monthly cost. If you're worried about high out of pocket costs, this could be a good option for you since a lot of services are included. Yelp is a great resource for finding a vet in an unfamiliar city. I used it in LA for Stimpy and couldn't have been happier with our experience. 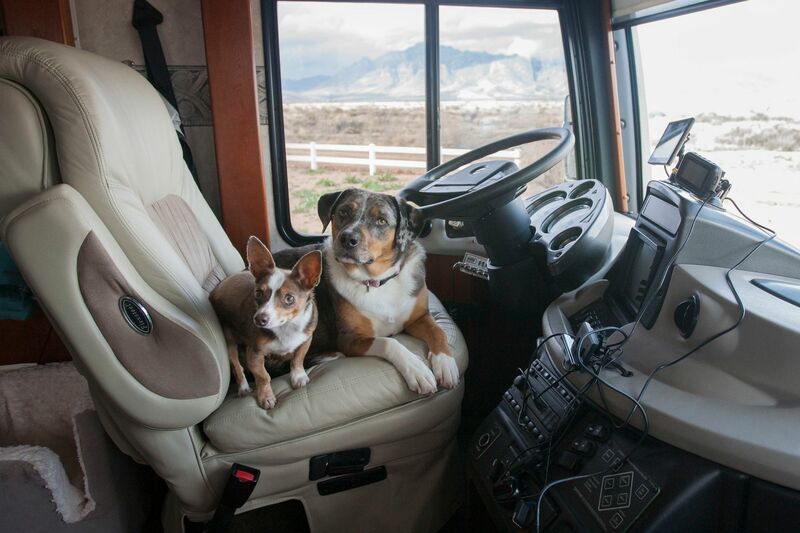 When calling for an appointment, I find it's helpful to tell them you're traveling with your dogs in an RV and are just passing through and would appreciate an appointment as soon as possible. The vet in LA was able to squeeze me in on a busy Saturday morning. Since Stimpy is blind, he needs to visit an ophthalmologist every 4-6 months. We let our California ophthalmologist know about our travel plans and they were able to direct us to a web site which lists accredited ophthalmologists by state. We are lucky. Our dogs are good travelers. In the beginning we had them crated while driving but they were so relaxed we now let them lie down near us. Lily lies on a blanket and Stimpy hangs out in his "command post". They each get a bone filled with a spoonful of peanut butter as we head out. Usually within 20 minutes they're fast asleep. We call this the "baby effect", just like people drive their babies around the block to put them to sleep. For your safety and to make sure you're not distracted, starting off with your dog crated is probably a smart choice until you can tell how comfortable they are with traveling. When our dogs are inside our home on wheels, sometimes we let them go naked and take their collars off. However on travel days, we always make sure they have their "credentials" on, just in case they slip out at a rest stop, or we get into an accident. All of the appointments, specialty procedures & bulk ordering of medication left a dent in our wallets the past few months! But look at these adorable little money pits! Again, planning ahead and spacing things out should make the cost more bearable.